From debut author Alyssa Hollingsworth comes a story about living with fear, being a friend, and finding a new place to call home. They say you can't get something for nothing, but nothing is all Sami has. When his grandfather’s most-prized possession—a traditional Afghan instrument called a rebab—is stolen, Sami resolves to get it back. He finds it at a music store, but it costs $700, and Sami doesn’t have even one penny. What he does have is a keychain that has caught the eye of his classmate. If he trades the keychain for something more valuable, could he keep trading until he has $700? Sami is about to find out. The Eleventh Trade is both a classic middle school story and a story about being a refugee. Alyssa Hollingsworth tackles a big issue with a light touch. Alyssa Hollingsworth was born in small town Pensacola, Florida, but life as a roving military kid soon mellowed her (unintelligibly strong) Southern accent. Wanderlust is in her blood, and she’s always waiting for the wind to change. Stories remain her constant. 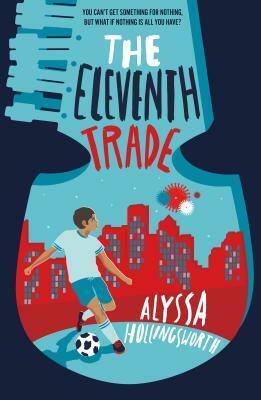 Alyssa is the author of The Eleventh Trade.